For a change, let’s push aside the history of a car brand that makes most of us yawn and fall asleep. Now, we’ve all gotten off the ground with our first cars when we were young, or for some, barely out of their diaper days. In my case, it was a slate-grey 1965 Standard Herald, bought used and fairly restored by my grandpa, and gifted to my parents on my first birthday in 1995. She was a beaut! We pootled around in her extensively, without keeping in mind that she was quite the grandmumzy among other cars on the road. Often, she’d stall in the middle of the road with steam spewing out of the radiator. It was fun. 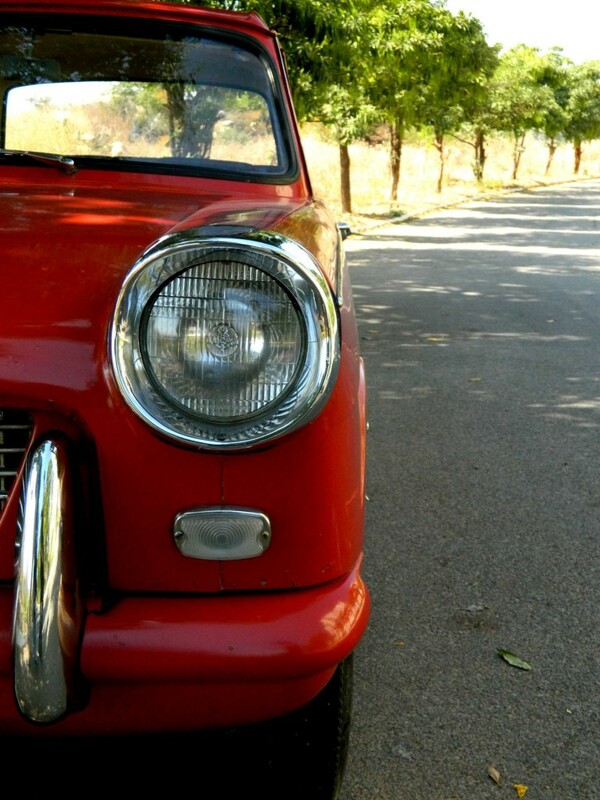 I mean, yes, we did envy people who drove past us in their modernistic Maruti Esteems, but there was something about the old girl that we learnt to love over the years. The cutest thing you ‘ve encountered in this age of jellybean-shaped cars? We’re not surprised. In the year 2000 however, it was time to let go of an old steed that was laden with one too many niggles to be sorted. Ever since its departure, my feelings for the car have grown fonder. On frequent occasions, I tend to wonder if she still exists in this world. Or could it have been used to make Tuna cans and utensils? I don’t know. But what I do know is that we’d sold it to a broker who looked very perilous – the kind who’d rip off its parts and attach them to hooks hanging from the ceiling. Yes, a similar view you’d behold in a beef shop. Whatever. I don’t wish to talk about it. 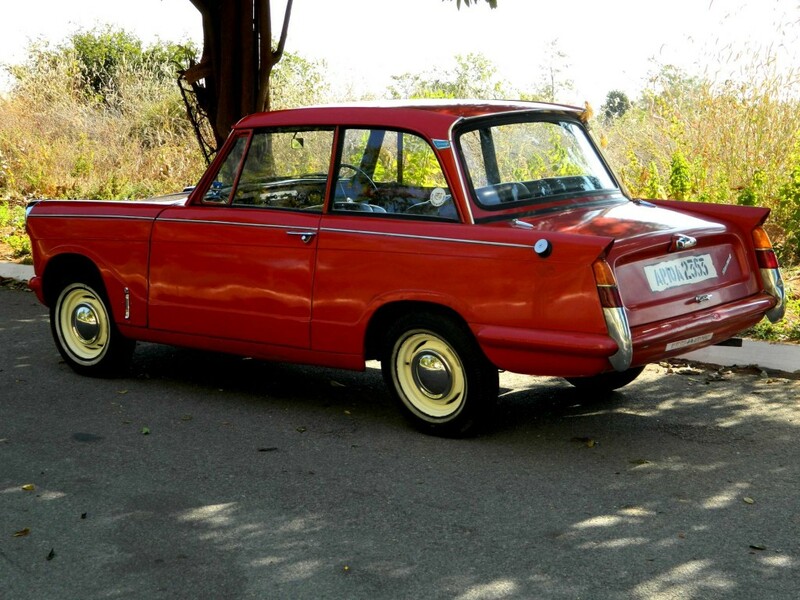 A few months ago, I happened to chance upon a friend who owns a similar Herald, painted in the popular ‘Signal Red’ colour theme. Shyam Krishnamachari – a dyed-in-the-wool classic car anorak, and one who holds a soft spot for pretty women draped in sarees, is the sort of person who’d go on-and-on, rattling away with the teeny-weeniest of details on his car. And trust me, he’s aware of Standard and its history like a pharmacist knows where those capsules are shelved in his shop! The moment I set eyes on it, I couldn’t help but sense a bit of nostalgia. A deep sigh, and a few batting eyelids later, I approach it and caress its sleek frame. It took me a good ten minutes to soak in the elegance and panache this baby exhibited. And this is the result of all the hard work taken up with, by Giovanni Michelotti – a personality whom I’d like to shake hands with. If he wasn’t a skeleton in his coffin, that is. You’ll notice a lot of intricate chrome detailing like the cowls, door handles, overriders, wheel caps, bonnet clip-ons and the strips running alongside the car. Oh, hold on, let me not forget my favourite bits like the cheese-grater grille and the shark-fin tail ends. 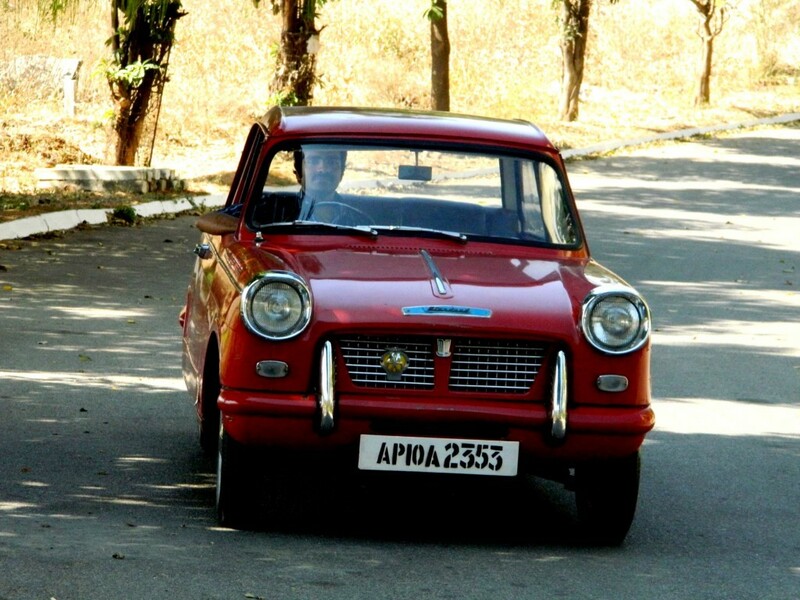 Apart from that, it’s a car you could proudly park next to a Padmini, and make its owner think “Oh dear, I should’ve listened to wifey when she told me that the Herald looked far better”. To be fair, it is a more genuine and resolved design. The interiors though, aren’t a great deal to get excited about, but “uncluttered and functional clarity with a fair amount of room” is about as appreciative as you can be. Sadly, its steering appears as large as a South Indian platter, and the lack of a three-spoke design makes it a shade unattractive. And this wasn’t the case with other English cars that served in the same era. If there was something I loved in its cabin, it would be the dashboard finished off with wood veneer. 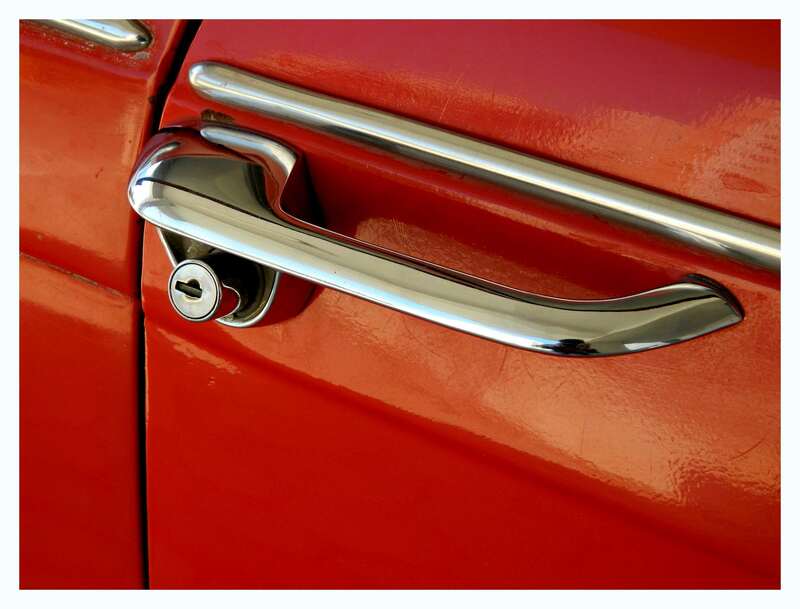 Pretty much everything that isn’t body-coloured metal is covered in rexine, barring the lovely chrome-plated window-winders. Seating isn’t a puzzle either, for there is good lumbar and thigh support on offer. 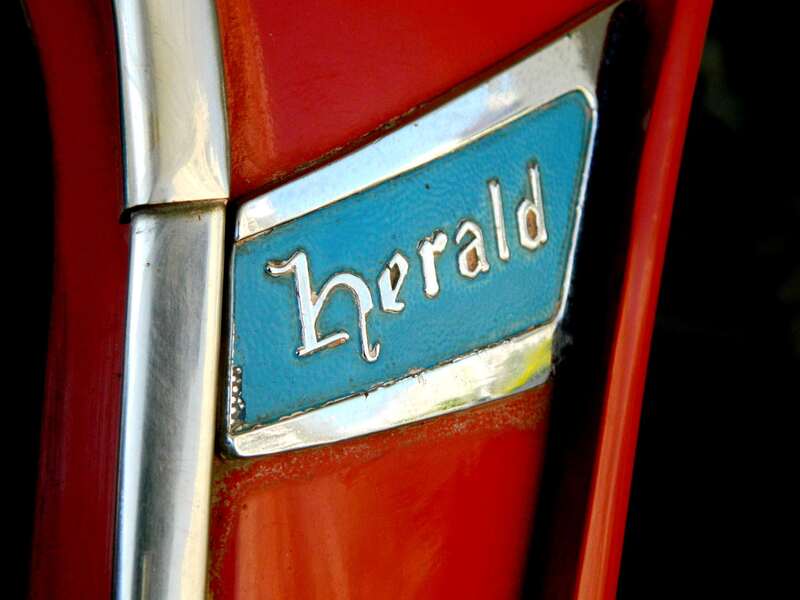 Starting up the Herald will leave you giggling as it coughs and burps. No doubt, the very thought of it doing both at once is insane. Its 948cc, four-cylinder, overhead valve unit is by no means, renowned for its reliability. Working on the engine, however, is duck soup. 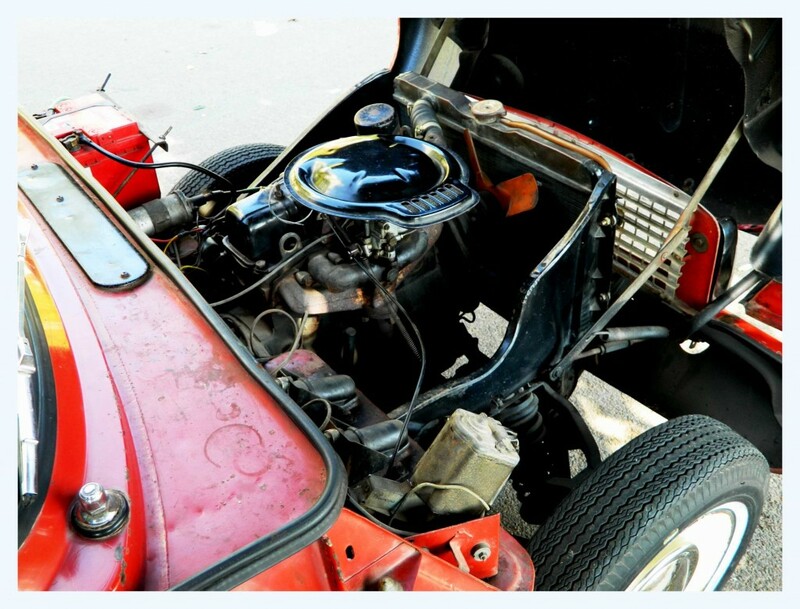 Method: Pop the hood ahead, plonk your bum on the tyre, lean forward and work on the engine! There’s just something inspiriting about having one under your hood. Rev the 38bhp motor, and your peers will be able to hear you coming from two streets away. I found twirling the steering a very light and assertive affair, although the four-speed gearbox emits a bit of a buzzing and rattling sound that would make you reach out for a pair of earplugs. The Herald also seems to take on road-lumps spiritedly, without unsettling its occupants. But one thing’s clear – this is not a Lotus around corners. So pushing it hard could only result in the wheels tucking in at the bottom, instantly reducing the tyres’ grip, with chaotic and heart-throbbing consequences. 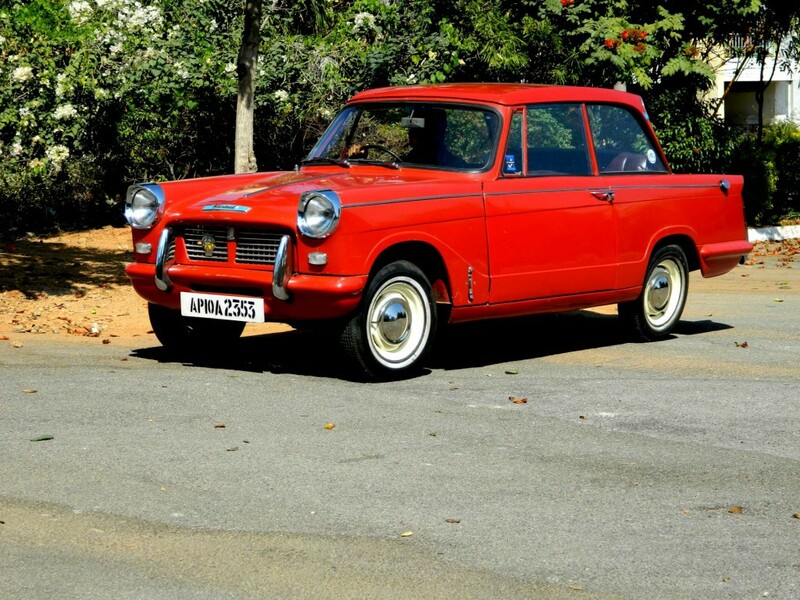 Driving a Herald and owning one is rarely a nasty experience. Remember, it’s got the Triumph’s blood, err, oil running through its DNA. And that makes it a masterpiece of Englishness in its own right. As for me, well, I was left rolling in my bed with bygone memories! The moment I set eyes on it, I couldn’t help but sense a bit of nostalgia. . .
Hrithik will be the first to own a Renault Lodgy!